Spire SP985S1-V2 koeler / cooler kopen? | That's IT! The Spire Kepler Rev.2 universal micro-processor cooler is the direct contact heat-pipe solution for the cost effective system. The two (2), 6mm heat-pipes make direct contact with the cpu heat-source, dissipating heat effectively and fast. The high density fins are crowned with a powerful fan for high airflow and great cooling performance. 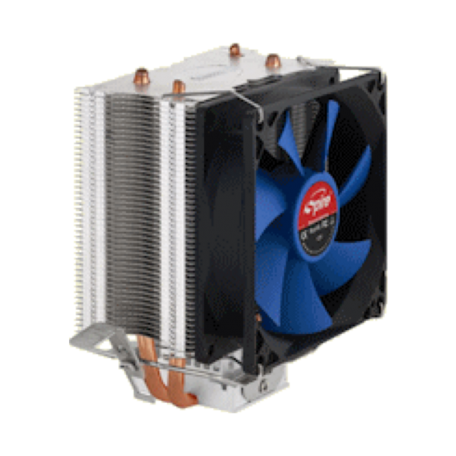 The 92mm dc fan provides ample airflow and silent cooling at19.0dBA. Compatibility is ensured with the multi-platform mounting clip for INTEL 1155/1156/775 and AMD AM2/3/FM1 micro-processors. The Kelper is the cost effective heat-pipe solution by Spire – Powered by Innovation.